The vitamins and minerals that potato juice contains help restoration and faster growth of the skin cells. If you cut a potato on thick slices and rub gently on the stretch mark for a few minutes to put the liquid on the place than the dried potato juice wash it with warm water, to prevent stretch marks. Massage warm pure olive oil at skin that will improve the circulation and reduce the stretch marks. Leave it for 30 min. and the vitamins A, D and E from the oil will be absorbed in the skin. Or, mix olive oil and vinegar and use it as night cream that will keep your skin moisturized and exfoliated. Exfoliate the skin with natural white sugar. Prepare the remedy this way: one tablespoon of raw sugar mix with some almond oil and few drops of lemon juice. Apply this on the stretch marks and rub gently for at least 10 min. every day before shower. Do this one month and you’ll see the difference. 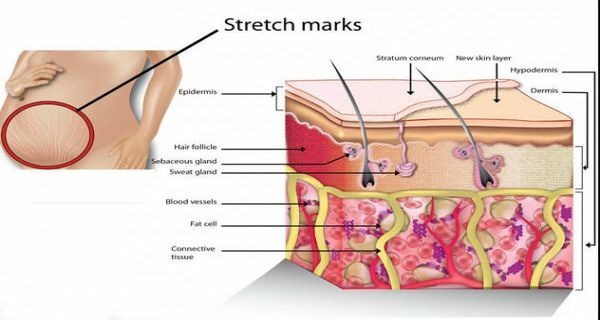 Regular detoxification of the skin helps a lot of getting rid of the stretch marks. Drinking ten glasses of water per day is the best way of hydrating the body. This makes the skin soft and elastic. Avoid coffee, tea or soda because they can cause dehydration. This is natural acid that helps heal and reduce stretch marks, acne, skin injuries, scars… Rub in circular movement’s fresh lemon on the stretch marks until the juice is soaked into the skin and after 10 minutes wash it with water. Or, mix equal quantities of cucumber and lemon juices for applying it on the stretch marks. This is efficient plant that heals many skin problems. Directly rub aloe Vera gel on the stretch marks and live it few minutes. Wash after with lukewarm water. Or make a mixture of one-fourth cup of aloe Vera gel, oil of ten vitamin E capsules and oil of five vitamin A capsules. Rub the skin until fully absorbed every day.